We all need a break from this cold spell. I suggest we return the St. John, Virgin Islands and try some “Blind Betty’s Pineapple Pizzazz”. Our last journey we discovered ‘Blind Betty’s Original’ sauce and it was a Caribbean treat, The ‘Pineapple Pizzazz’ is a sauce of pineapple and habanero peppers. Hopefully this will warm our palate and soul. It is recommended to use this sauce with ham pork or chicken. In the words of ‘Blind Betty’, “Let your imagination guide you on this trip to paradise”. 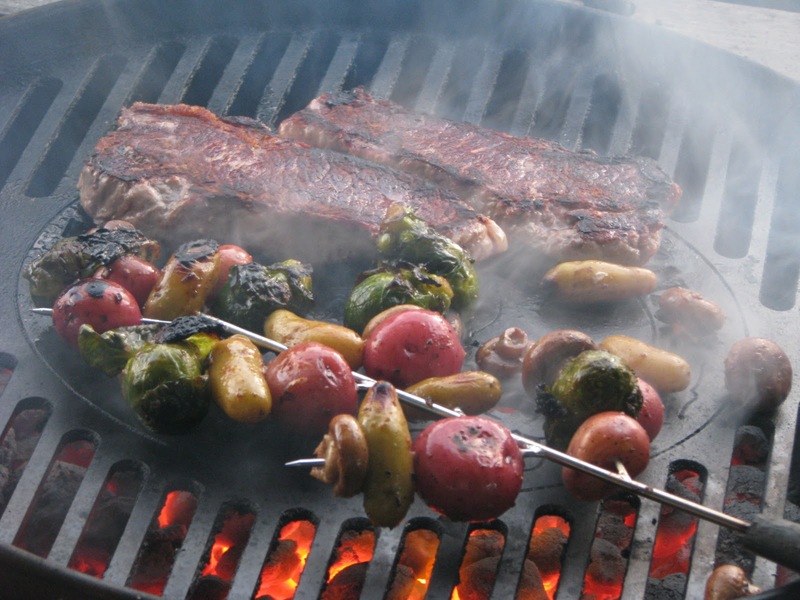 “Fumee Aromatisante Pour Bar-B-Q” What does it mean? I have no idea, but it sounds impressive on the label of our ‘Flavorwood Bar-B-Q Grilling Smoke” natural compressed wood canisters. The good people at ‘Camerons Products’ sent me a couple samples of this smoking wood in a can for our barbeque. 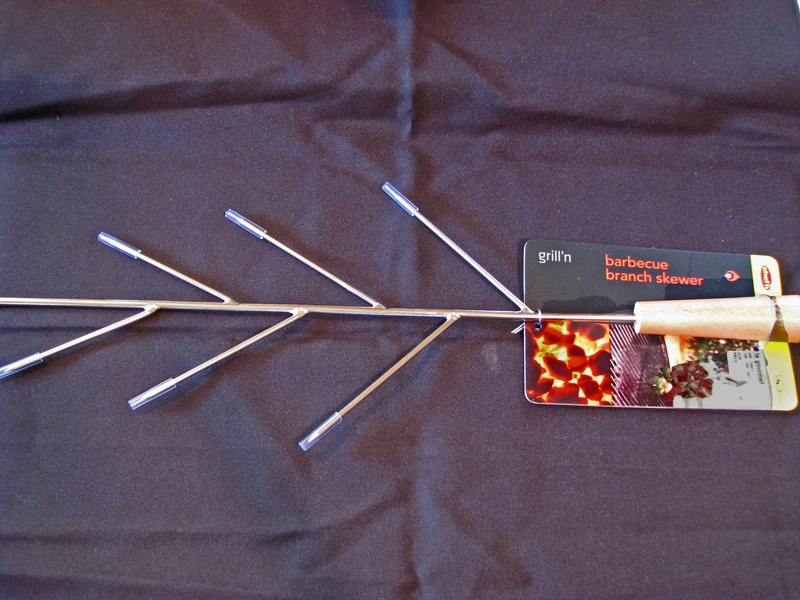 This product is a small can filled with specific woods for smoking on your grill. Place this can on a heat source and smoke will fill your cooking vessel. 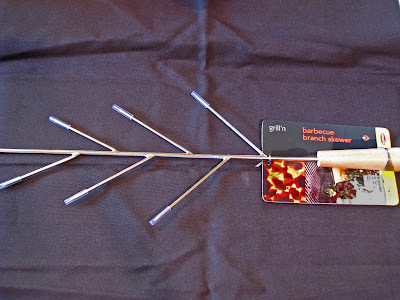 This package had three different flavors of wood; Apple, Hickory and Mesquite. We are going to sacrifice a chicken to test this product. I actually read the instructions. I know, who needs to tell you how to barbeque. 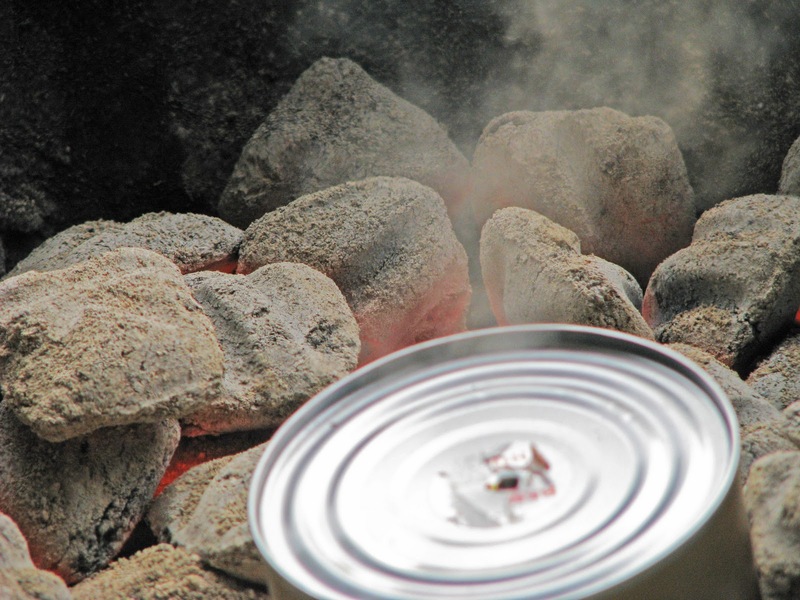 ‘Remove all the paper labels from the can.’’ Place on grill or coals 5 minutes before grilling’. The instructions were followed precisely and lo and behold, “Smoke”. 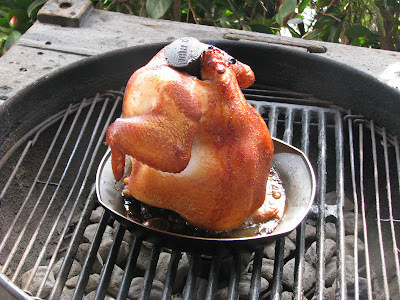 Once this baby got hot it hissed and spew out a flume of smoke. Today, we used hickory and it smelled lovely. We place the lid on our kettle and let the magic happen. These cans of wood should last an hour with proper usage. We had a very hot fire and it smoked for about 40 minutes. This was plenty of time to smoke our chicken. 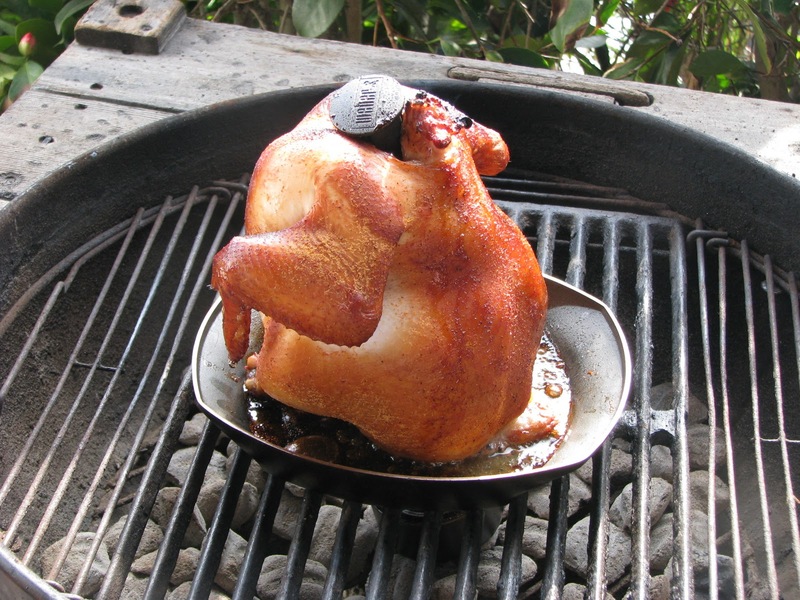 Our chicken was cooked and smoked to perfection. This meat will be used in a chicken pot pie that we will cook later. 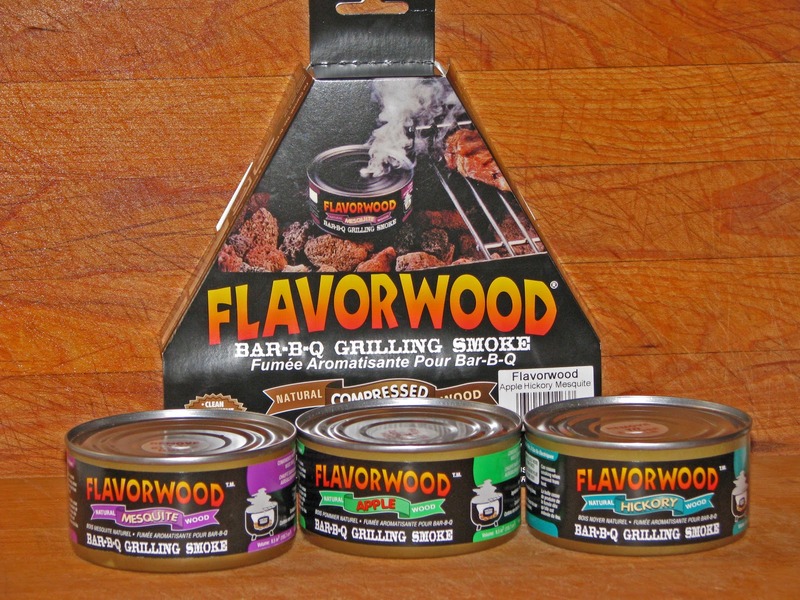 Flavorwood smoking cans are a great product. No fuss, no muss! Just follow the instructions and instant smoke. These cans of smoking wood would be great for camping or that tailgate party at the ballgame. Convenience is the selling factor of this product. It is clean and easy to use. Flavorwood will receive the ‘Mad Meat Genius’ seal of approval. You too can become a certified ‘Kansas City Barbeque Society’ judge. If you are located in Northern California, a barbeque judging class will be offered in Corning on March 5. This is a highly informative and fun class. You will learn about the three categories; presentation, taste and tenderness, that are used in competition. This is a hands on class. Once the classroom presentation of rules and regulations is completed you will actually have barbeque samples to practice your new knowledge. Now, that is my kind of class. We have completed this class and will recommend it even if you have no desire to judge. Barbeque knowledge galore will be gained from this experience. Once you have completed your class you will be eligible to judge KCBS sanctioned BBQ contests. 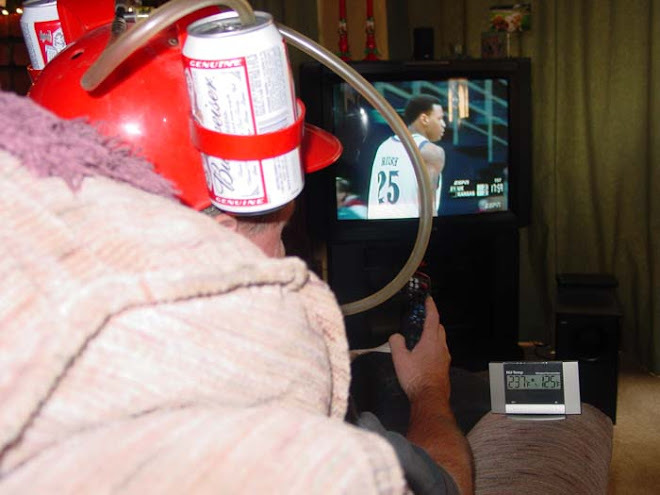 These contests are held throughout the nation. 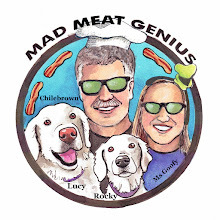 If you have been a Mad Meat Genius fan you will know how much fun we have had. See you there! What exactly is Kimchi? It can be many different things to many people. Generally it is a fermented Korean dish made of vegetables and spices. 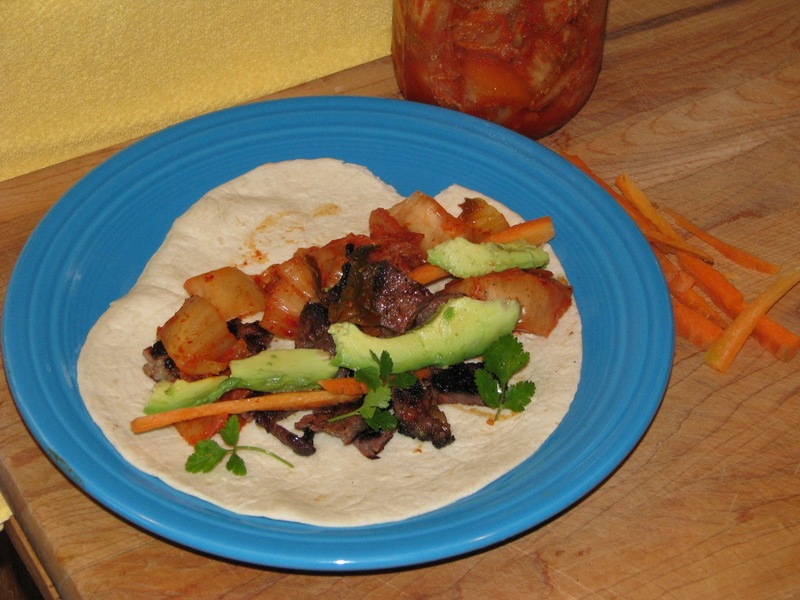 Napa cabbage, onions, radishes, cucumbers, garlic, green onions, chile powder and salt are typical ingredients. 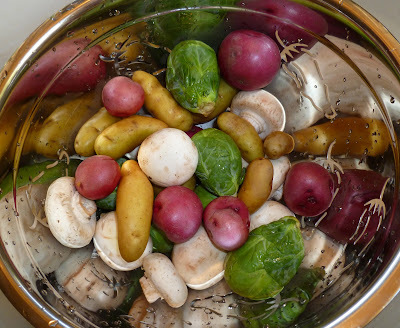 These vegetables and spices are mixed together and left to ferment for varying lengths of time. The results are a funky, spicy and sometimes hot dish that is used as a condiment. 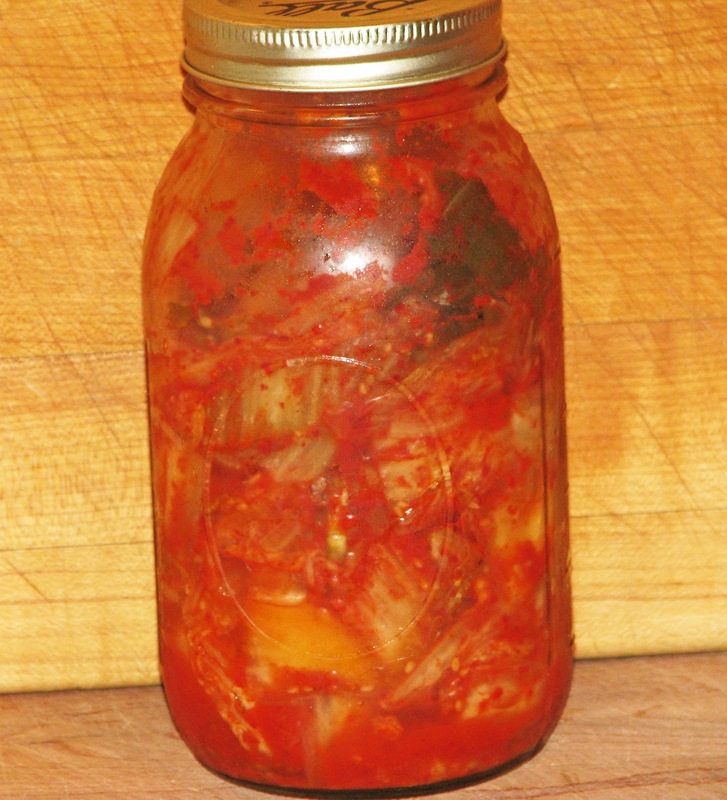 It just so happens that we have a Korean acquaintance that generously gifted a jar of home made kimchi to our pantry. It sat in our refrigerator for a while because I had really no idea what to serve it with. 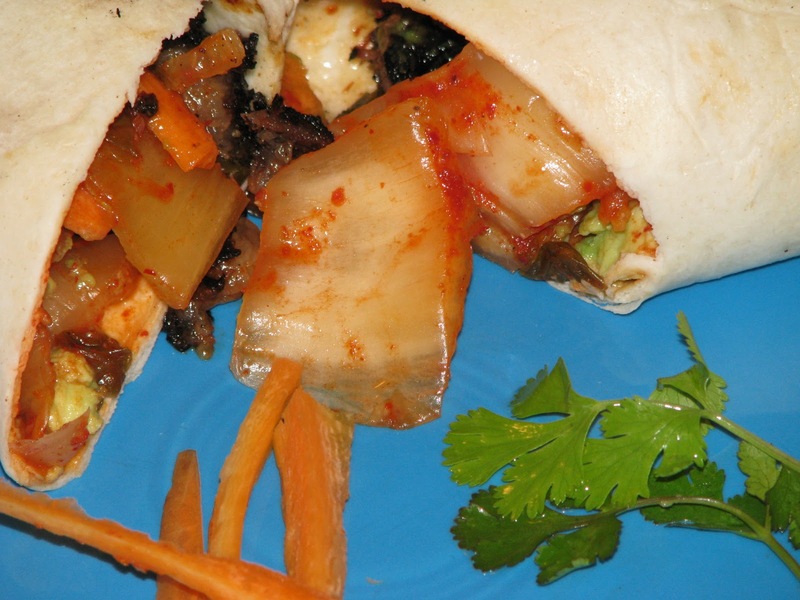 Kimchi burritos have been the buzz in the local food rags and it sounded intriguing to me. What the heck! Some thinly sliced beef short ribs were marinated in soy, ginger, garlic and honey. They then were grilled over a hot mesquite fire. This would be the protein for our burrito experiment. Thinly sliced carrots, cilantro sprigs and some avocado would accompany the kimchi and grilled beef. The ingredients were rolled in a fresh flour tortilla. 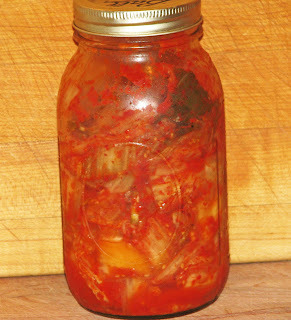 Kimchi has a very distinct funky odor. It can be a little off putting if you are not used to it. The first bite into our burrito was a flavor explosion. The marinated short ribs were yummy, rich and delicious. The kimchi cabbage was crunchy, a little sour tasting and salty. The pepper heat was not overpowering but a welcome compliment. This condiment was a good balance to the rich and flavorful meat. I now understand why Kimchi burritos are the talk of the town. They are a non traditional flavor treat. I am now a Kimchi convert. I am looking forward to trying it with some other dishes. What is in your pantry? 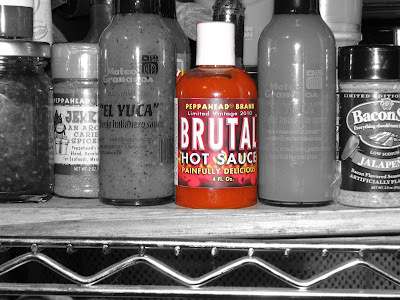 Brutal hot sauce stands out on my hot sauce shelf. Brutal hot sauce is another gem from that hot sauce genius ‘Larry from Peppahead’. 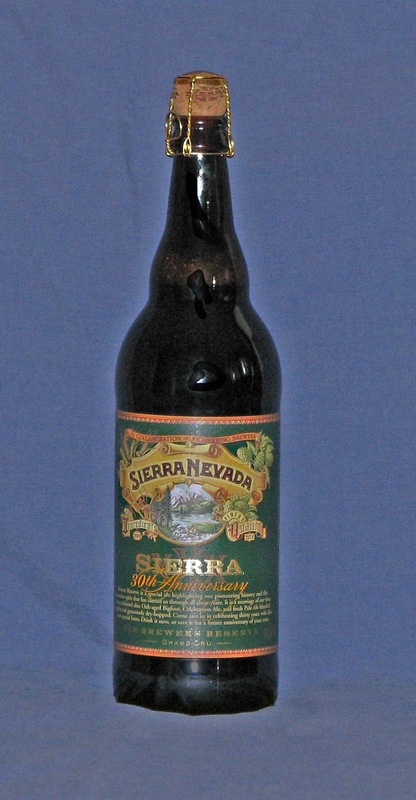 ‘Painfully Delicious’ claims the label of this limited vintage brew. Larry grows a lot of his own peppers and creates some wonderful sauces. These are bottled in limited numbers and sold at farmers markets or mail order. Let’s take this sauce off the shelf and give it a try. 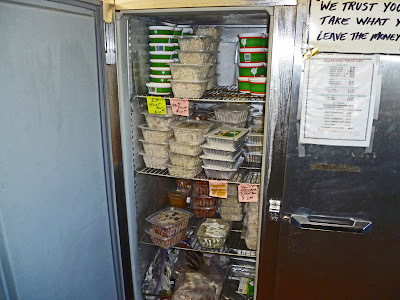 Sometime there is a great Meat Market located right in your own backyard. 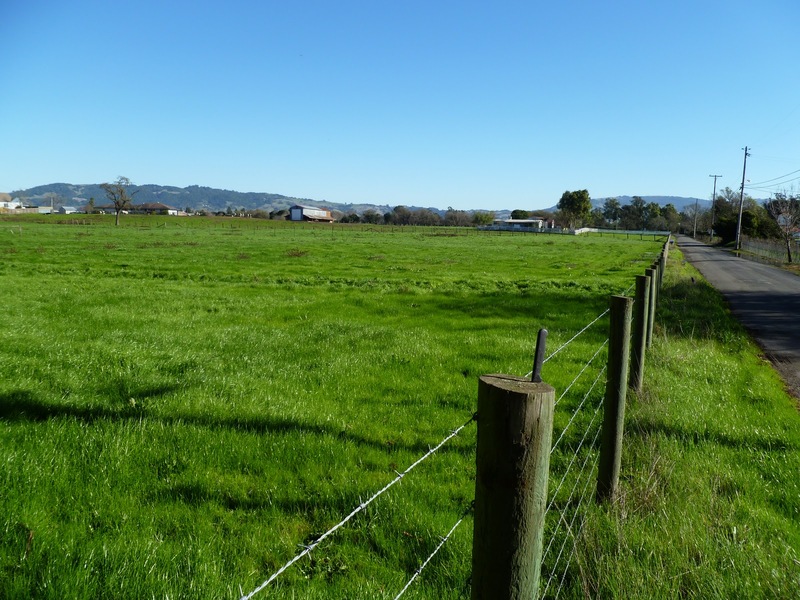 Central Foods is located in El Sobrante California. That is only a hop skip and jump from our abode. Central Foods is a small independent market that thrives and survives with competition from the large Wally-Marts. There just so happens to be a great meat market inside Central Foods. 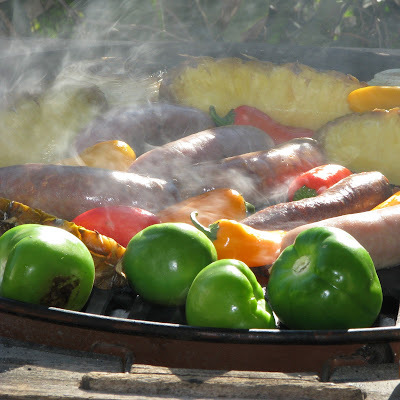 They carry meat from Niman Ranch and make several different types of sausages. This meat market sells stuffed chicken breasts. I also noticed a beef roast that was stuffed with yummy ingredients. There are meats that are pre-marinated to make your meal easier. 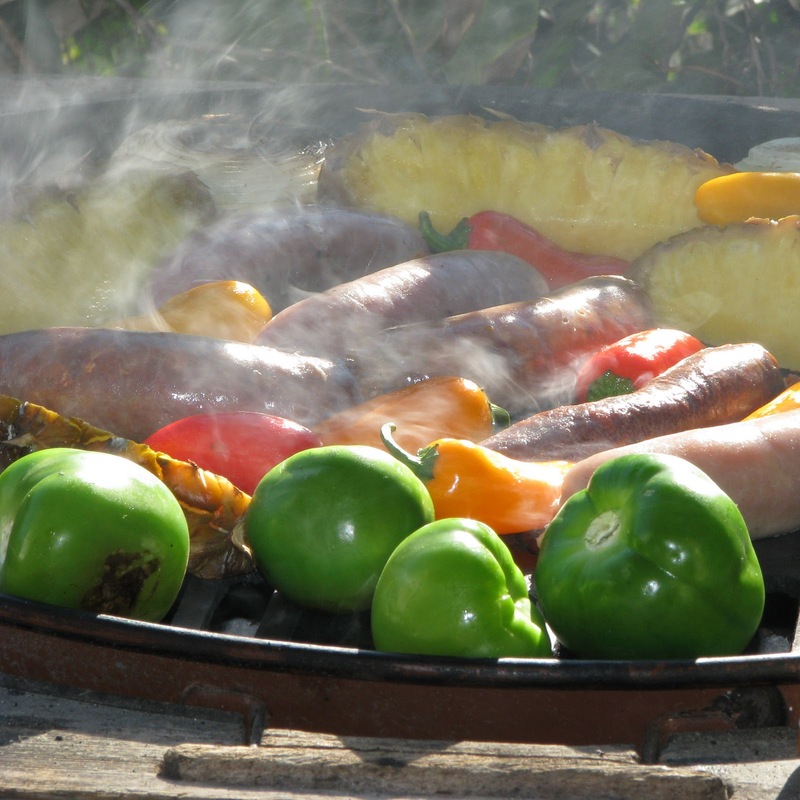 Chicken apple, chipotle chicken, Italian, chorizo are several flavors of sausage available. Our shopping cart was filled with these sausages and we returned home. The grill was fired up to cook our tubes of meaty flavor. We also roasted some vegetables to create the base for a chile-verde stew. These sausages were full of flavor. Some New Hatch chiles were removed from the ice cave to make our meal over the top delicious. I have lived in this area for around 20 years and never have visited Central Foods. We have driven by and never stopped. 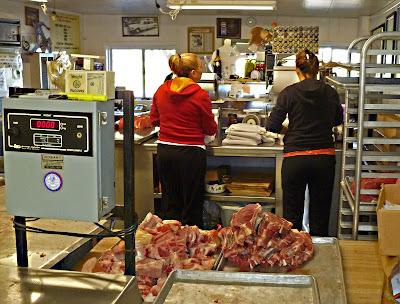 People have mentioned that we needed to stop by and check out the meat market. Well it took me 20 years but now I am going to be a regular customer. 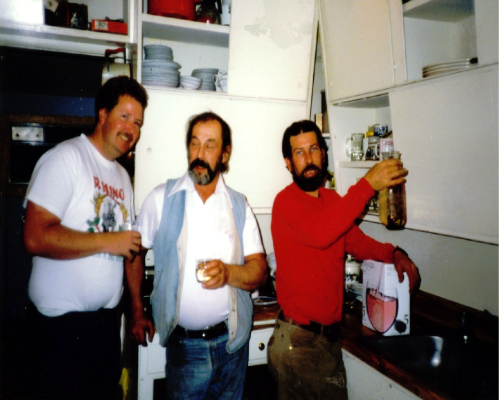 Generous, Loving, Mentor, "Meatmen" Dutch Oven team,Vietnam Veteran, Awesome Cook, and my "Best Man". Larry, I have missed you for a long time!." R.I.P. Let’s all jump in Ms. Goofy’s ‘Formula One Racing Honda” and speed on over to Pittsburg California’s ‘New Mecca Cafe’ to continue our journey to find the ultimate chile verde. The New Mecca is an East Bay institution. Guillermo Muniz opened this Mexican café in the mid sixties and it has become a destination restaurant ever since. The New Mecca has deep ties to the Bay Area. They are caterers to the Oakland Athletics and the San Francisco Giants. This restaurant is a good and maybe the only reason to ever visit Pittsburg. The City of Pittsburg has awarded the New Mecca 2.34 million dollars of redevelopment money to enlarge and modernize the restaurant. They are open while the construction progresses. We almost did not recognize downtown Pittsburg. The redevelopment has transformed a once scary neighborhood into an inviting warm shopping, dining and entertainment district. We had to maneuver around some construction to enter the New Mecca. Once inside it was like meeting an old friend. 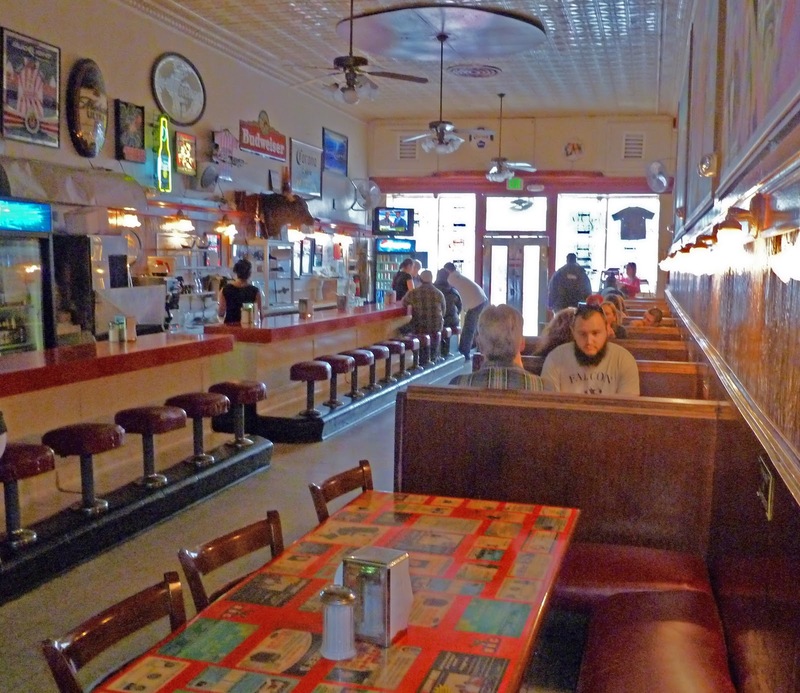 The interior looks like an old fashion soda shop with its small booths and round stools surrounding the counter. The one thing that was missing was the crowds. This is the first time ever that we have not had to wait for a booth. It is a good thing because Ms. Goofy was beginning to drool from the wonderful aroma of Mexican food wafting from the kitchen. The waitress immediately brings over menus, chips, bean dip, and two different types of salsa. (Ask for the optional hot sauce). Be careful that you do not fill up on the bean dip because the plates to come are generous. Chile verde is always our quest but Ms. Goofy wanted carnitas. Two huge plates of pork were delivered to our table of swine morsel anticipation. The chile verde was moist, juicy and tender. The chile was mild and not a big taste factor in this plate of comfort. Your choice of tortillas was available to sop up the juices of green pork stew. Oh wow! 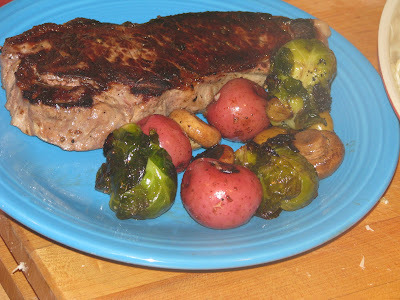 This was tasty, filling and a prescription to rush to the couch. Ms. Goofy’s plate of carnitas was full of crisp and chewy pork love. The chile verde was very decent. The pepper flavor that I crave and search for was lacking. The dish was still comforting and satisfying. ‘New Mecca Cafe’ has all the comfort Mexican dishes we all love. There is local history at New Mecca that will be preserved and carried on to new generations. If you are in the neighborhood give it a try. It is that time of year to put on your plastic bibs and belly up to the table to crack some crab. During the next several month there will be crab feeds galore to feast on buckets of crusty crustaceans. Fundraisers and club events are a great excuse to join a crowd for a crab feeding frenzy. 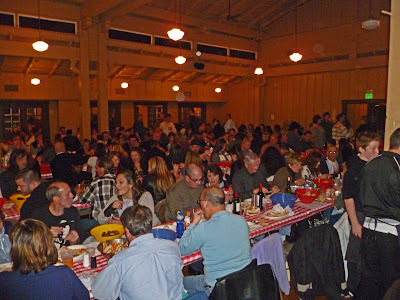 There is a certain etiquette and ceremony to a crab feed. We will touch bases on a few pointers and crab feed rules. On the West Coast, ‘Dungeness’ crab is king. This crab is very rich but at a crab feed it needs to be even more indulgent by dipping this succulent ‘Meat of the Deep’ into butter. You will have to bring your own butter warmer and butter. It needs to be the real deal. Heaven forbid margarine! Our butter warmer also serves as a mood lamp. It is a good idea to bring some home made cocktail sauce. Ms. Goofy whipped up this sauce and got rave reviews. Combine all ingredients and add cayenne to desired heat. 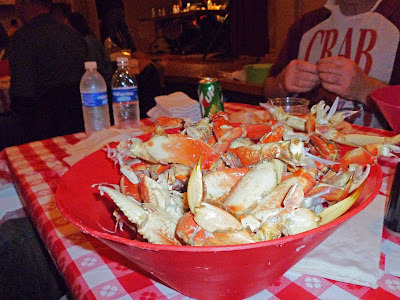 If you are the first person to receive the bucket of crab; do not pick out all the claws. Chances are you will have somebody at your table that likes the bodies and will leave all the claws for you. Pace yourself if it is an all you can eat event. Our crab feed had an added bonus of barbequed Tri-Tip. Tri-tip and crab, does it get any better? This crab feed was a trencherman’s delight. Last, but not least, Have Fun! Enjoy the company, buy a raffle ticket, eat, drink, and then get up and dance. I can do a mean chair dance. Where else can grown-up men and women wear plastic bibs and feast on crab? It is foggy and cold Sunday morning at the ‘Walnut Creek Farmers’ market. We are on a mission to find ingredients for our ‘Rosemary Chipotle Roasted Nuts’ recipe. 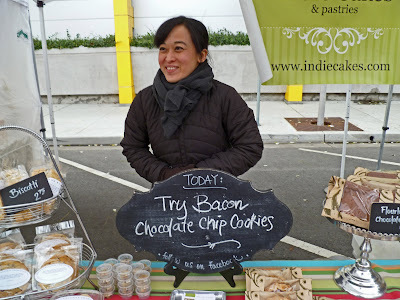 As soon as we arrive at the market a booth sign proclaiming ‘Bacon Chocolate Chip’ cookies grabs my attention. These cookies were sweet and savory. They were so good; they did not even last for a photo. Our recipe called for a mixture of fresh cashews, pecans, walnuts, and almonds. We did find almonds and walnuts and we were satisfied. We rushed back to the house to make our recipe and hunker down for a day of football viewing. 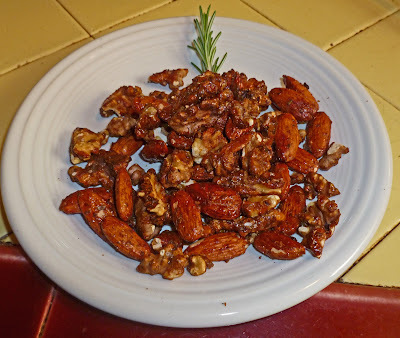 We only used walnuts and almonds. You can use any combination of nuts that you have in stock. I also substituted honey instead of brown sugar. Combine all ingredients with half of rosemary and approx 2 teaspoons salt. 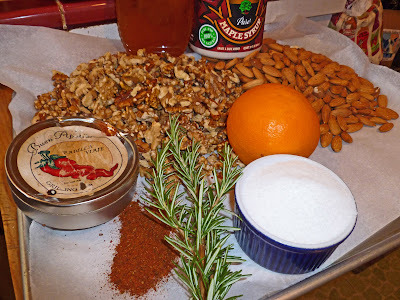 Place nuts on greased baking dish. I put them on parchment paper. Roast for 25 minutes at 350 degrees stirring occasionally. Remove from oven and add a little more salt and rosemary. Cool and stir occasionally to prevent sticking. This was a great snack to go with our frosty beverages while viewing the football playoffs. The rosemary is a nice touch to the sweet salty mixture. We will return to the ‘Walnut Creek Farmers Market’ to stock up on bacon chocolate chip cookies soon. Put away your snow shovel and grab your suntan lotion. 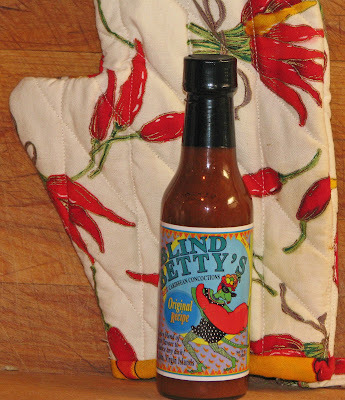 We are going to take a trip to St. John Virgin Islands to try some ‘Blind Betty’s Original’ hot sauce. 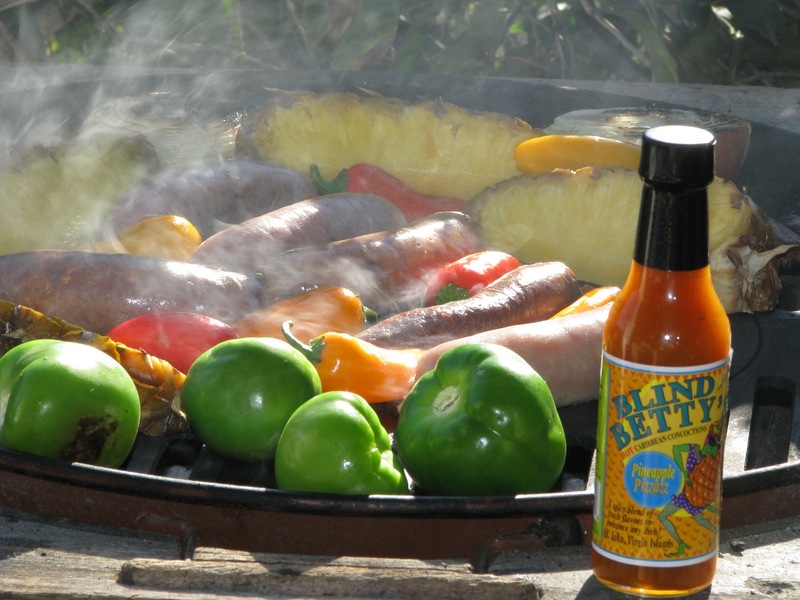 This sauce is a cornucopia of Caribbean flavors. It is fueled for fire by the habanero pepper. This sauce claims it can be used for multiple purposes such as: stir fry, marinade, and soups or just as an accompaniment for your meal. Today’s sauce is a winner of the ‘Fiery Food Challenge Golden Chile’ award. Put on you sunglasses and join us while we visit the islands. 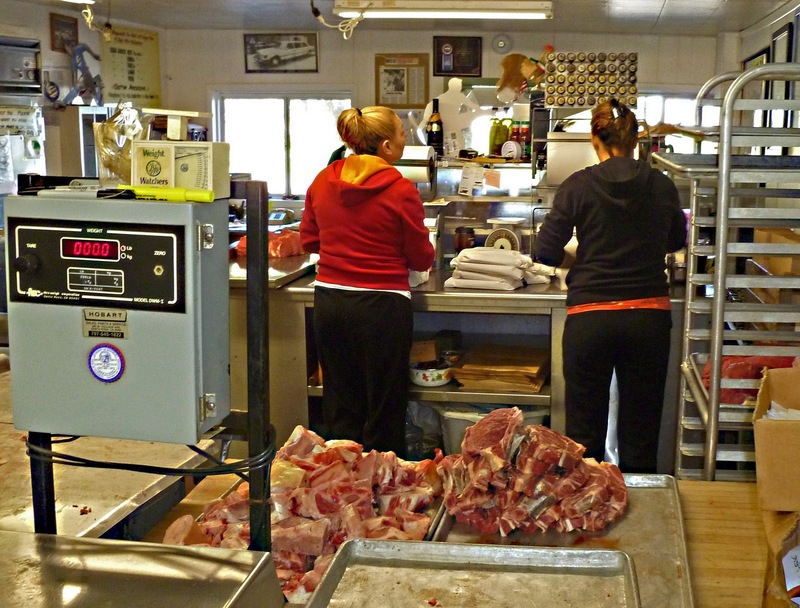 We are following a hot meat market tip from a ‘MMG’ reader named Colleen. She mentioned Ibleto’s in Cotati California. We did a little research on the World Wide Web and found that Arturo Ibleto is the ‘Pasta King” of Cotati. He also shares the same last name as my good friend Angelo from Petaluma. It is a small world because Angelo has mentioned his brother several times and I just have never connected the dots. This will be a double treat for a ‘Meat Adventure’. If Art is anything like Angelo we will have found a new meat destination with pasta. 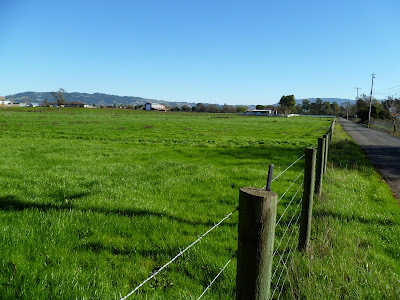 Ibleto Meats is located a couple of miles off of the main Highway 101. The houses are divided by green and luscious pastures. You will see a couple of signs proclaiming fresh pasta and the “Pasta King”. After pulling into a small driveway you will see a small barn like building. 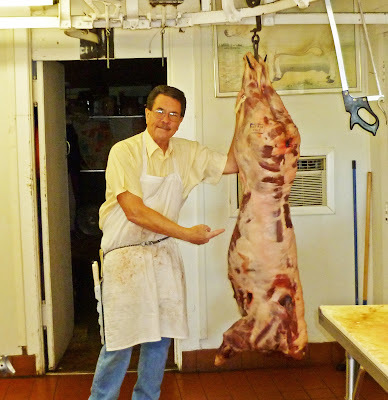 It looks similar to Angelo’s Meats in Petaluma. We walked into Ibleto’s and saw several people cutting and wrapping various cuts of meat. We asked one of the butchers, Bill, if Art was there. Unfortunately Art was not, but Bill graciously showed us the establishment. Bill is pictured with a wild boar that is prevalent in this area. There are a couple of freezers full of pasta’s, ravioli’s, soups, lasagna and different sauces. An honor system is Ibleto’s unique way of paying for your purchases. You pick your products and total your purchase and just leave the money on the table. “Wow”. Pasta is King here at Ibleto’s but they do sell a bunch of Angelo’s meat products. They will also custom wraps your meat projects. We loaded up Ms. Goofy’s ‘Formula One Racing Honda” with ravioli’s and pasta and headed home to get some water boiling. I wish we could have met Arturo. Bill told me his Italian accent was just like Angelo’s, or is it the other away around. We had some tagliarini the first night and it was melt in your mouth good. Fresh pasta is a treat. 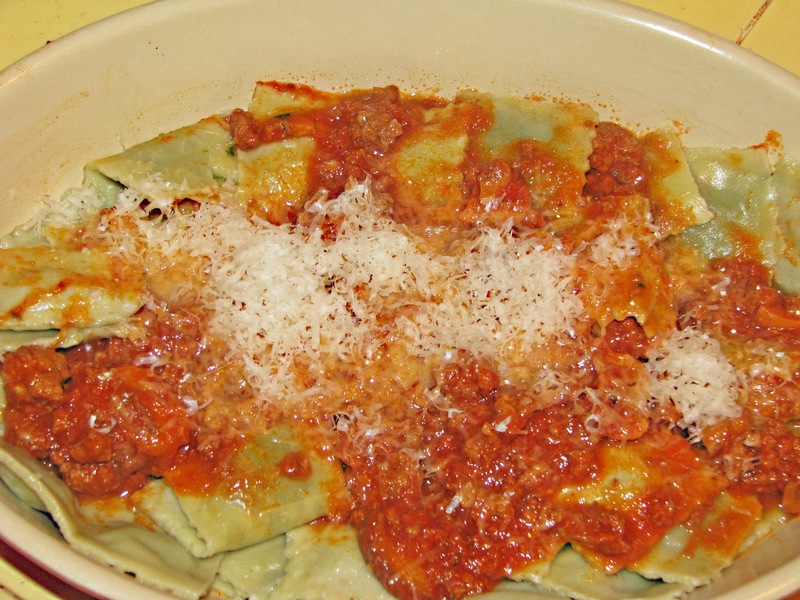 Some ravioli with prime rib was served several nights later. It was so good I broke out into song, which I will spare you.. From what I have tasted, we will have to agree. 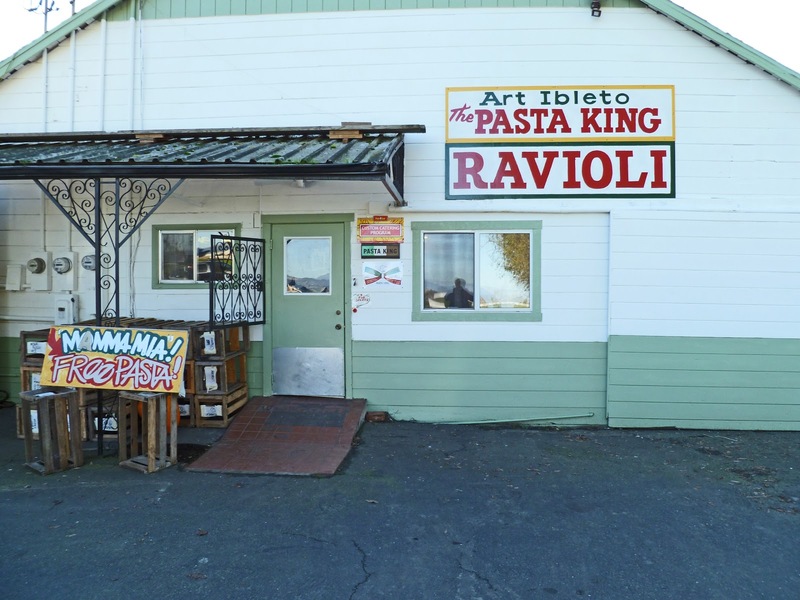 Art Ibleto is the ‘Pasta King”. 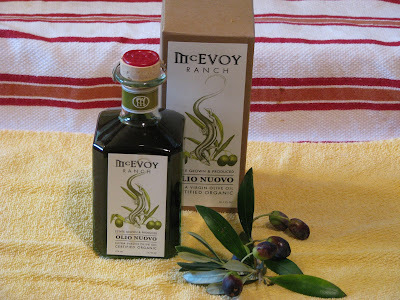 ‘Olio Nuovo from McEvoy Ranch’, is the new oil for the year. 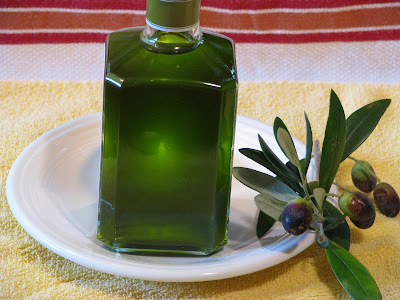 It is the first pressed extra virgin oil from organic olive trees. It is only available during the November harvest and for a few weeks afterwards. It is prized and sought after for its freshness and unique flavor. It is intensely aromatic and usually has a peppery rich fruity flavor. 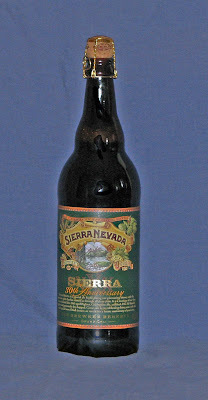 This bottle was gifted to us from my sister “ThePresidentofcookies”. This bottle is some of the most fluorescent green color I have ever seen. This bottle of olive nectar must be something special coming from McEvoy Ranch. They have the reputation and price tag to command attention. We have toured their Ranch and would highly recommend it to anybody that is interested in a wonderful olive experience. I think we need to stop guessing what this oil tastes like and pop the cork. 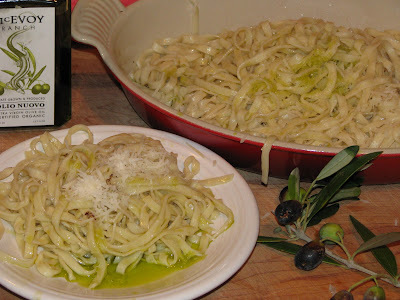 We decided to try this with some tagliarini pasta that we just picked up from the “Pasta King” of Cotati. (Details later) This was fresh pasta that only needed to be boiled for several minutes in a hot tub of salted water. Some fresh parmesan reggiano and a slight dusting of salt and pepper was the only fussing our olive oil vehicle required. Olio Nuovo was sparingly poured over this wonderful pasta. This oil is so green it painted a stripe of green gold wherever we poured. The oil flavor is fruity and grassy at the same time. If you could describe the color green this oil would be the definition. We did not notice the pepper bite usually associated with this type of oil. A little buttery with just a hint of sweetness makes this olive oil unique and very flavorful. The pasta and cheese melted in our mouth. A little drizzle of oil went far in this most tasty dish. If you have an opportunity to try this oil, do not miss out.